Here’s a weird one. 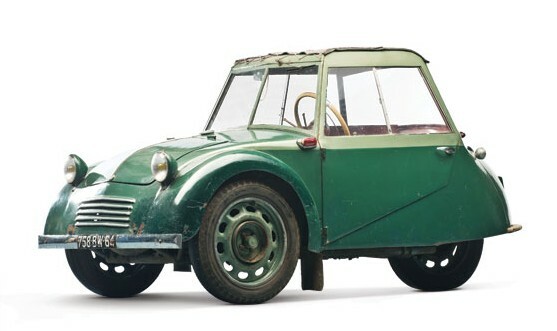 Built by a Frenchman, last name Grataloup, of spare parts he found. It’s kind of well put together, with the engine essentially under the driver’s seat, but exposed on the right side of the body. It’s a single-cylinder Villiers two-stroke of 247cc making 7.5 horsepower. It’s normal sized twin front wheels help it reach 52 mph. It’s the only one ever built and they aren’t even sure when it was built. The man just showed up with it one day at Citroen garage in France. Read more here and check out more of the collection here. This entry was posted in Uncategorized and tagged 1955, auctions, cars, classic cars, grataloup, microcars, rm auctions by classiccarweekly. Bookmark the permalink.